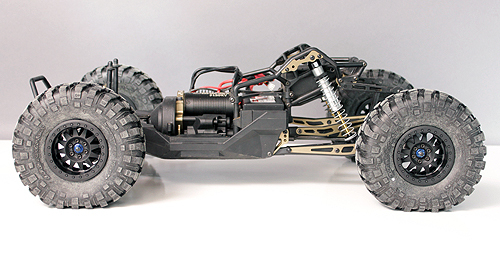 The Yeti is one of those high speed, multi-terrain capable vehicles that many turn to for extreme rock racing performance. The combination of the independent front suspension and rear solid axle design gives the driver a unique driving experience. The transmission and power system pumps out speeds that will launch it over whatever is in your way. And of course, the look of the aggressive rock racing buggy draws in any attention seeker. This rig puts you in the action with success right out of the box. But like with any hobby machine, there will be drivers who want to customize their rigs to suit their taste and because of that Axial has a full list of options available to make your machine stand out. Here we have a AX90026 Yeti from the test rig fleet that has received a bunch of option accessories. Here we’ll go through those accessories and their benefits so you can determine if this is the best option part for you. Plus you’ll get to see the part installed and imagine what it would be like on your own Yeti. For those who push their rig to the limits and want aluminum parts to replace plastic, there is the CNC machined aluminum tower. 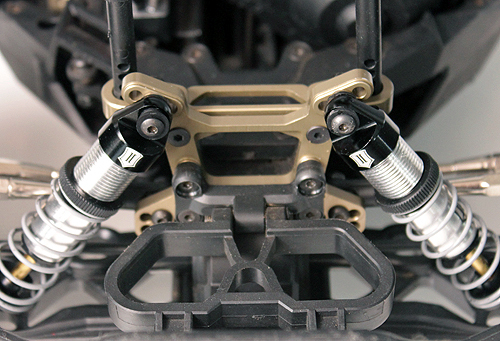 This tower comes with all of the hardware necessary for installation and it provides ultra secure mounting points for you shocks and links without sacrificing adjustability. The front of any off-road vehicle is subject to abuse and those roof landing don’t help either. To firm up the body support, this CNC aluminum body post mount is available. This bolts right in place of the stock plastic unit and comes with the required metric hardware for the install. While you’re on your aluminum upgrade kick, take a look at these important pieces. These two aluminum swaybar mounts add support to allow the swaybar to do its job. The mount is adjustable so you can alter the placement of the bar. 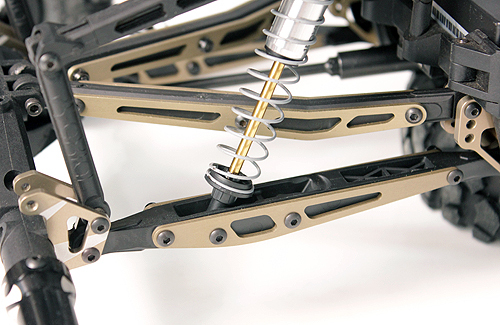 Since the rear upper shock mount isn’t a conventional shock tower, these plates are available as an option to firm up the mounting points in case you decide to go big on the jumps. 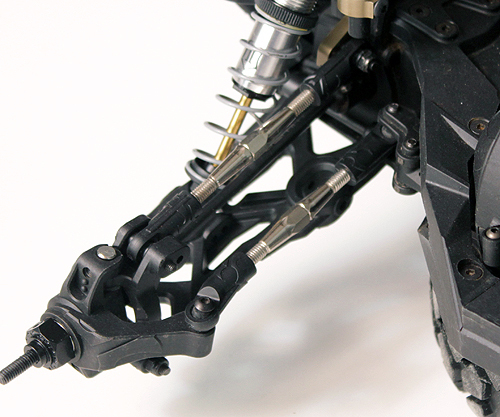 When you bump up your power for speed or jumping, the suspension will take on extra stress. 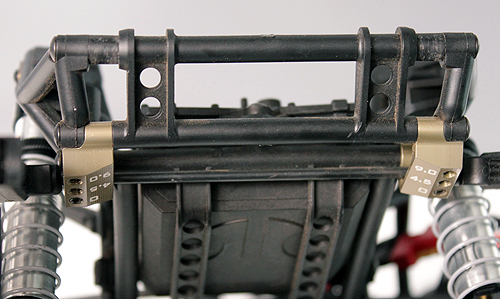 Consider using the optional forward lower suspension link mounts. These strong CNC machined aluminum parts are finished like all of the other Axial aluminum option goodies and comes with the hardware to secure the parts to the chassis. 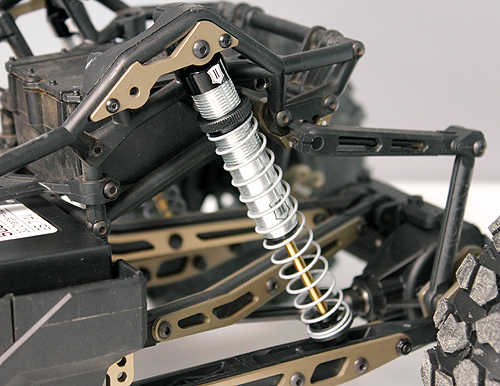 Steel universal axles can provide smooth and consistent performance when adding more power to your Yeti. The stock components will work well, but if you’re increasing performance, these steel uni’s will improve efficiency. 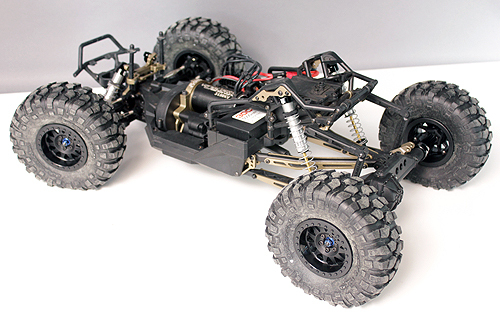 The factory supplied motor plate is perfect for the the electronics supplied with the ready to run kit, but some will eventually look to push their rig to the limits. For those looking to boost the power, you may want to consider the Machined Adjustable Motor Plate. This plate and mount is machined from stronger aluminum, hard anodized and even features an etched logo. This sturdy mount will keep your motor stable and gears in place. 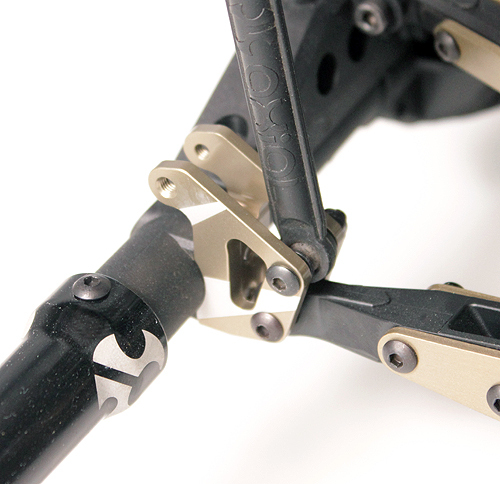 These aluminum plates are simple to bolt on with the included hardware and increase the durability of the plastic link, plus they give the suspension a high end look with the hard anodized finish. 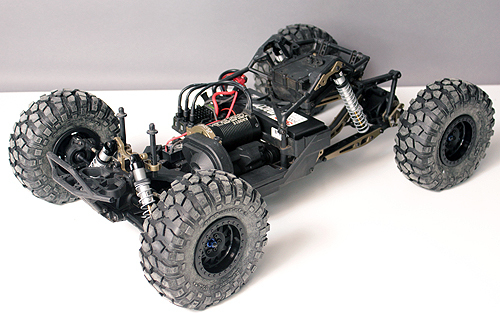 The Yeti is set-up with offset hex hub adapters on the wheels so the front offset is less than the rear. Make the front and rear offset hubs the same by using this Full Width adapter set. 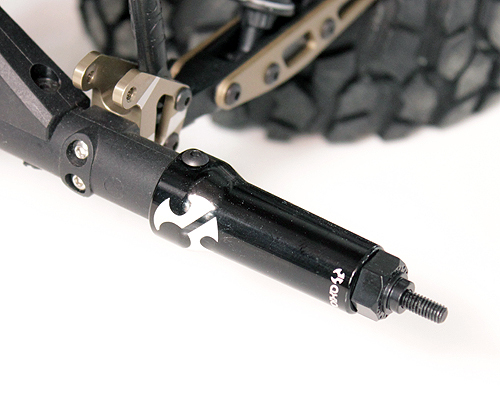 This set will also improve durability as the axle tubes are machined aluminum, anodized black and feature etched logos. 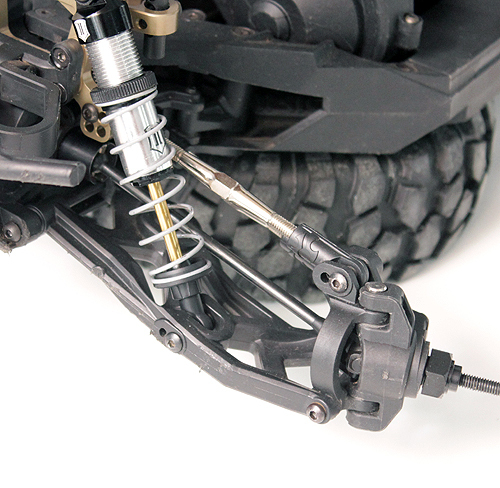 The set also comes with the necessary long steel axle shafts. 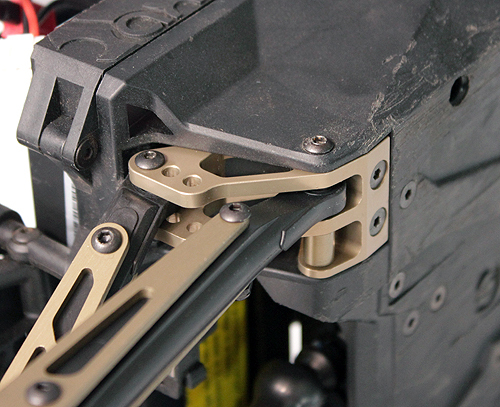 These CNC machined 6061 aluminum mounts are direct replacements for the plastic link mounts on your AR60 axles. 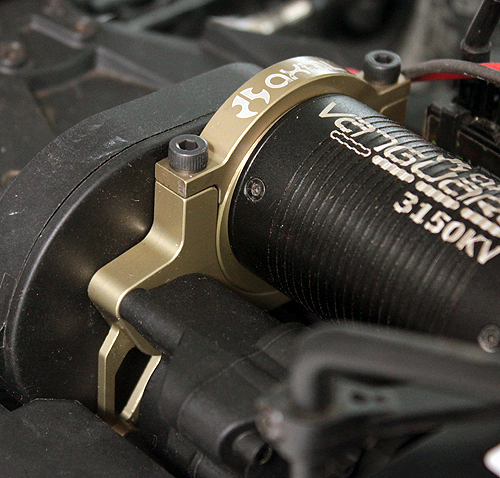 They’re hard anodized and etched for a custom look. It only takes a few minutes to swap out and is a great option part to use when upgrade the power on your Yeti. 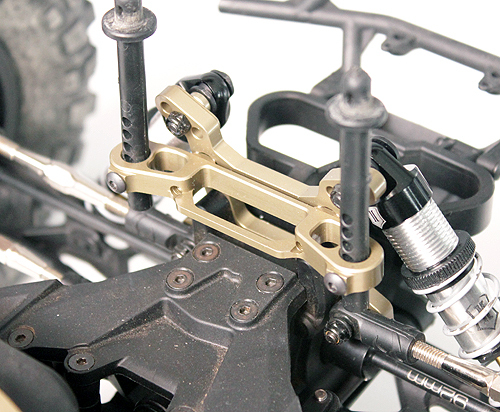 A full turnbuckle kit is available for the Yeti RTR that replaces the stock fixed links for adjustable links; part AX31249. The set includes the all four tie-rods that are machined aluminum and hard anodized and the required plastic rod ends for installation. However on this particular build, the individual components were used. The four tie-rods are plated steel in two different sizes and the necessary plastic rod end set is listed above. Regardless of which set you decide to add, these adjustable turnbuckles will now allow you to tune your camber and toe on the front of the Yeti.